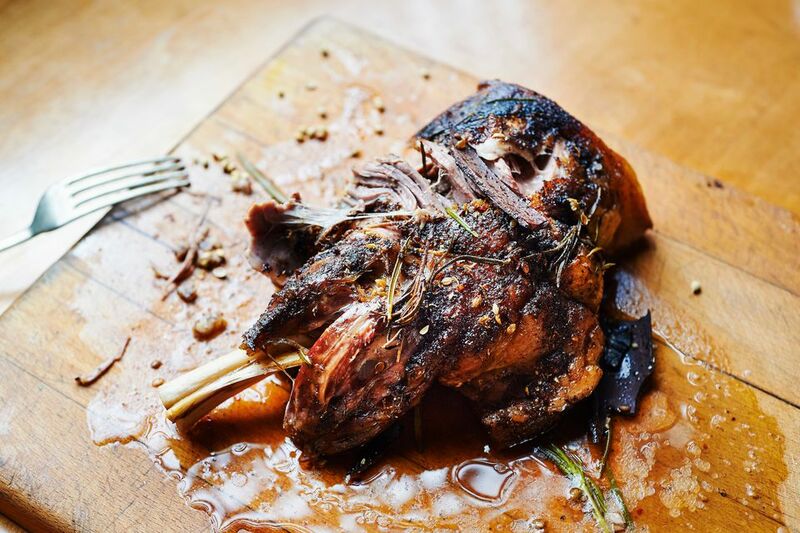 Try this delicious, tender roast leg of lamb recipe the next time you want to spent a drizzly day inside cooking. It takes seven hours to cook, but you do not need to stand over it; pop it in the oven, where it will only need an eye cast over it from time to time. Heartily seasoned with herbs, vegetables, and wine, this leg of lamb is roasted until it's falling-apart tender. The wonderful aroma the lamb and vegetables create as they roast away makes this elegant, yet homey, dish as pleasant to cook as it is to serve. With a sharp knife, poke 1/2-inch-deep holes scattered evenly over the surface of the leg of lamb. Insert the sticks of garlic cloves into the holes. Mix the olive oil, sea salt, rosemary, thyme, sage, and black pepper. Rub the surface of the meat with the herb paste and place the leg of lamb into a large Dutch oven. Carefully pour the white wine into the side of the pan; avoid pouring the wine over the meat itself, to keep the herb marinade in place. Refrigerate the leg of lamb for 2 hours, turning once every 30 minutes. Preheat the oven to 275 F. Place the Dutch oven into the preheated oven and cook the lamb and marinade plus 1 cup water, covered, for 3 hours, basting with the pan juices occasionally. Uncover the pan and place the roasting vegetables, sprinkled with the salt and pepper, around the sides of the lamb. Continue roasting the leg of lamb and vegetables for 4 hours, basting occasionally, until the meat easily falls off the bone. Remove the roast leg of lamb and vegetables to a serving platter and allow it to rest for 15 minutes. While the roast lamb is resting, taste the pan juices and reduce them by simmering for a few minutes, if necessary. Serve the seven-hour lamb leg, sliced or shredded, with the warm pan juices.